Fast-growing cities like Bangalore will benefit from EMBARQ's collaboration with FedEx. Photo by Dave. This post originally appeared on FedEx’sEarthSmart blog, as part of a new collaboration between FedEx and EMBARQ, the producer of this blog. Ashwin Prabhu is an urbanist based in EMBARQ India’s Bangalore office. In November, Ashwin and eight of his colleagues from the United States, Brazil, Mexico and India visited FedEx global headquarters to attend a week-long leadership training program hosted by FedEx. The leadership training program is just one component of a FedEx grant supporting EMBARQ’s efforts to promote sustainable transport in cities around the world. In this article, Ashwin writes about the challenges Indian cities are addressing as the country urbanizes, the roll of EMBARQ in meeting these challenges, and how expertise from a logistics company such as FedEx can help drive urban development. India is one of the few remaining large countries of the world yet to experience the urbanisation of its population. In most regions – from the US, to Europe and Latin America – more than 75% of people live in urban areas. By contrast, only 31% of India’s people live in cities. This, however, is set to change dramatically in the coming decades. By one estimate an additional 250 million people – equivalent to 80% of current population of the United States – will call India’s cities home by 2030. The number of cities with more than 1 million people will increase from 42 today to 68. For the cities themselves, this demographic transition means that the demands on already stressed urban transport systems will grow significantly. Other convergent trends suggest an even greater increase in urban travel demand than urbanisation alone would predict. Rising incomes mean that the number of leisure and recreational trips per capita will increase. Additionally, the increasing involvement of women in the formal workforce will further increase urban travel. In the next two decades, therefore, Indian cities face both a great challenge and a great opportunity – decisions about urban transport investments made today will resonate for the next generation and beyond. If they are to remain vibrant and dynamic engines of economic growth while also providing a high quality of life for its citizens, they will need to develop transport systems that can provide affordable, safe and equitable access to the economic and social opportunities, minimize travel times, reduce local air pollution and also mitigate the growth of carbon emissions. EMBARQ India believes that following the principles of sustainable urban transport can help achieve these goals. This involves three main aspects – promoting the development and use of high quality public transport, promoting urban development of a type that promotes non-motorized forms of travel such as walking and cycling, and preventing private motor vehicles such as cars and two-wheelers from becoming the predominant mode of travel. The experience of Bangalore illustrates some of these ideas. Bangalore is a city of roughly 10 million people in the southern Indian state of Karnataka. It is a well known hub for the Information Technology industry. The public bus system in Bangalore is one of the most extensive and widely used in not only India but the entire world. On any given weekday the Bangalore Metropolitan Transport Corporation (BMTC) carries 4.8 million people on more than 6100 buses across nearly 2400 routes. It accounts for nearly 50% of all motorized trips made in the city. Nevertheless, public transport in Bangalore faces some significant challenges familiar to many cities in the developing world. Chief among these is the rapid motorization of the city’s population. From 2000 to 2008, the number of registered private vehicles (cars and 2-wheelers) in the city increased from 1.18 million to 2.75 million, a phenomenal increase of 133% in only 8 years. This increase is reflected in the major traffic jams the city experiences every workday, widely regarded to be among the worst in India. 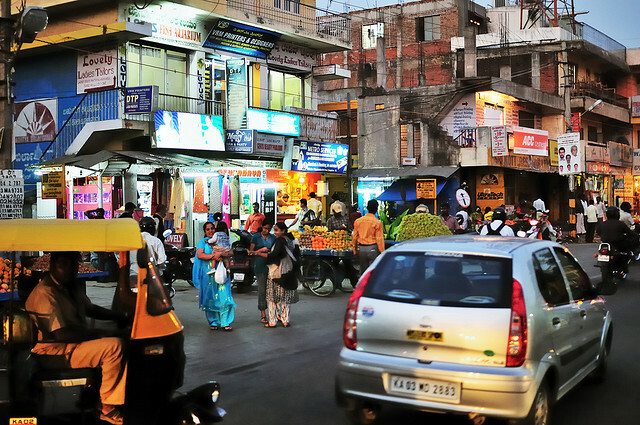 EMBARQ India is helping the city of Bangalore, India, make the vision of a sustainable urban transport future a reality. We are working with the city bus agency, BMTC, to help optimize its existing services and develop new ideas and innovations in urban bus transport provision. First, we are helping the organization develop a mechanism for comprehensive and consistent performance monitoring (“If you can’t measure, you can’t manage”). Secondly, we are also working to reorganize routes and develop alternate services based on in-depth analysis of travel demand. Finally, we are helping the city design state-of-the-art transfer facilities and user information. Collaborations with companies such as FedEx are vitally important for bringing international best practices to help improve the performance of urban transport providers in rapidly growing cities in India. There are, after all, significant similarities in the core competencies of FedEx and organizations like BMTC; FedEx is interested in moving packages as efficiently as possible, while urban transport providers seek to move people as efficiently as possible. Many of the operational concerns facing FedEx and the organizations that EMBARQ India works with – route design, crew scheduling, fleet management – are essentially the same. We are very excited, therefore, to have been given the opportunity to collaborate with and learn from the experiences of FedEx to help make Indian cities great places to live, work, and play.